The easiest window treatments. Ever. Period. This window treatment is easily the simplest one I've done. You'll need fabric, a rod, ribbon and hemming tape. It will take you 30 minutes, tops. Start by picking out your fabric. You won't even need a full yard for this one, unless you'll want it to be operational (if you want it to cover the window, you'll need more fabric). Make a rod pocket at the top and then hem the sides with the hemming tape. I used a tension rod for this one, but these can also hang outside the window from a pole. Then just hang the fabric and use your ribbon to figure out how high you want the fabric to drape. When you figure that out, just cut both ribbons to the same length and tie them up. That's it! Get creative with your fabric and the ribbon. 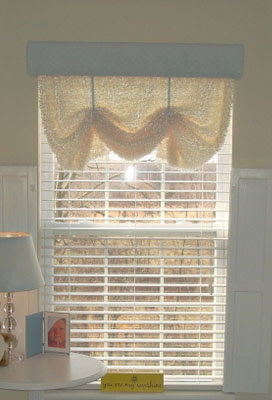 You don't always have to use fabric by the yard -- if you see a drapery panel you like, cut it down to size and use that. Try using a fabric shower curtain or a sheet with a cool design on it. Even a cute towel would make this an adorable window treatment in a bathroom. The sky's the limit!! I always have loved the window treatments you make. This one is very pretty!! I hope you don't mind, I linked to this post on my blog. As I took your advice and used a sheet to make a curtain in my bathroom. Hope you get a chance to take a lookie. (I still want to do the roman shade you made, and I think I will do the topper panel on my curtains in my bedrm.) Thank You!! What is the blue part at the top? Did you make that as well! ?